During 2014, we are celebrating 30 years of bringing customers from the UK to the Channel Islands. 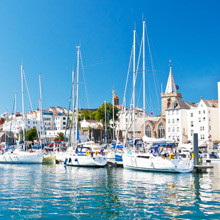 As part of this celebration, we will be writing about 30 Guernsey essentials, from attractions and outdoor activities to special local food and some lesser-known island treats. The best, probably the only way to visit St Peter Port is on foot. From the seafront, climb any of the flights of steps leading to the High Street. From there, indulge in a bit of shopping in one of the boutique shops before exploring the beautiful church in Church Square, famously the closest in the British isles to a pub! Behind the church, the Old Quarter is full of antique dealers and art galleries. This is the area where the medieval town once stood. Market square features regular market days, and is a vibrant place to fill your basket with some of the island’s many goodies, from the locally grown vegetables to the fish brought in by the fishing fleet. You cannot get any fresher than that! More steps will lead you to the States Chambers, and then back down towards the harbour via the cobbled streets lined with coffee shops and gourmet restaurants. This entry was posted in Guernsey Activities and tagged St Peter Port. Bookmark the permalink. Guernsey Festivals: What’s on in 2019?